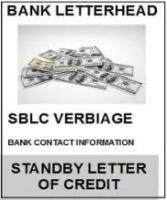 A standby letter of credit is also known as SBLC, SLOC, just standby, or LOC sometimes. SBLC is a must if you deal in imports and exports. In the case of the standby letter of credit, the financial institution makes an undertaking to a beneficiary, e.g. a supplier, an exporter or trader, to perform a payment for the client, if the client is not able to fulfil their contractual obligations and if the beneficiary submits a written demand for payment. There are certain obligations and conditions that must be met. 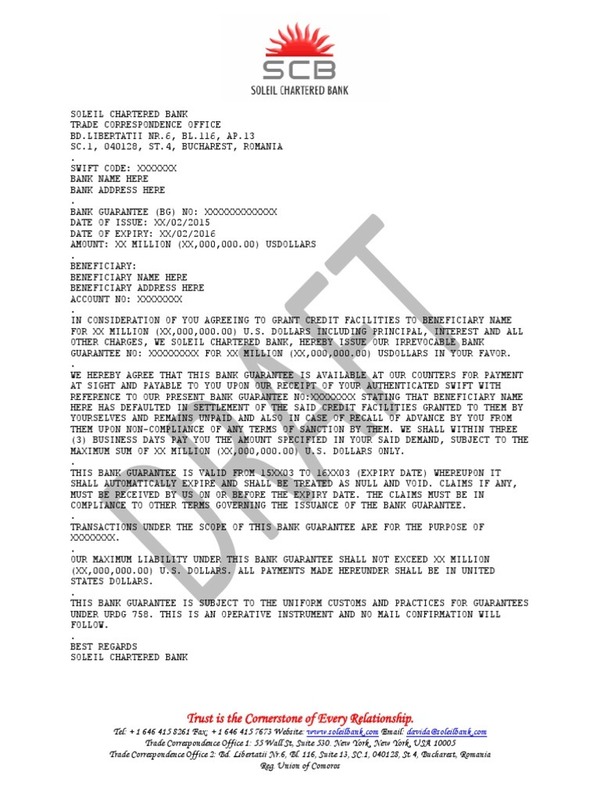 To ensure that, a reputed financial institution provides a standby letter of credit. With years of experience in undertaking the wishes of both parties in a business deal, we know exactly what to do. We perform basic, formal underwriting duties which ensure that the party seeking a letter of credit, or LOC has the financial credibility that is desired. The financial institution guarantees, through the SBLC, that even if the company ceases operations, becomes insolvent, or cannot pay for any reason whatsoever, then the business obligations and conditions of the deal will still be fulfilled. The standby letters of credit are issued for a certain term. In general, this is the period of the term of validity of a contract or the period of the delivery of goods for which a contractual undertaking has been made. A standby letter of credit can be deleted before the expiry date agreed upon. This can be performed through the declaration of the client, and necessarily with the consent of the beneficiary. Do you need an affordable SBLC to fullfill a contractual committment? Do you need a SBLC for additional collateral for a credit line? We have several options available from both top world banks and from a private NY bank. specifies list of documents against which payment will be made. 2. Upon receipt of CIS application, passport, Article of Corp and proof of payment, AMD will complete compliance, background and verify funds for payment. 3. AMD issues contract for MT799 or MT760. 4. Customer signs contract and complete initial deposit (0.50%-1%) to set up MT799/SBLC, for Provider and Broker fee. We are not able to waive fees, or pay after delivery for monetisation. 5. Within 10 banking days, RWA and MT799 Delivered to Client's receiving bank. 6. If for any reason, Bank is unable to issue RWA, we will use our Back up banks, and if our back up banks are not available, customer will receive a full refund. 7. If we are contracted for MT760/SBLC or BG, client must deposit 2-10% in Attorney escrow account in Sacramento, CA. or Houston, TX. 8. Within 15 days, AMD's Provider will issue MT760 SBLC or BG. AMERICAP DIRECT are experts in arranging top banks and investors. Getting with our help for SBLC for lease at Top-25 banks, you company will have the letter of credit to qualify for the loan in major commercial banks for increasing of work capital or financing your own project. SBLC for lease Тop-25 banks is more preferred kind of collateral by lenders. LTV (filling of loan with collateral) for such guarantees is to 75% from nominal. It has the highest index than other types of collateral. We offer for our client organization in releasing SBLC for leasing at such banks: HSBC Bank London, Barclays Bank London, Deutsche Bank AG, RBS (UK) or any other Top rated bank on term 1 year and 1 day with the prolongation possibility to 5 years. In some cases, term can be longer. Payment for leasing is made only after successful transmission (verification) to the Beneficiary bank (lender) with Swift MT 760 during 5-15 days from the day of such transmission. Commission payment is also made by client with SBLC leasing payment according to IFPA through Swift Wire Transfer – MT103. SBLC Fees, Process and issuance? Can You Afford POF SBLC? POF SBLC– Proof of Funds Standby Letter of Credit is often required in import/export trade transactions. It is also useful when seeking bank instrument collateral for project and trade finance, leveraging your position to buy and sell bank instruments along with other credit enhancementsituations. The conventional way to buy an SBLC for proof of funds is to approach an institutional bank or security brokerage with whom you may already have a relationship with. You will need considerable assets, history in good standing with the bank, and general credit worthiness in order to be successful. SBLC for one year and one day at $10M USD giving it back with no liens or encumbrance. The legal documents is called a Deed of Agreement (DOA). Both banks will also send a Ready Willing and Able (RWA) message to each other. The Providers bank confirms it’s ready to issue the SBLC and Receivers bank confirms their client has the funds. 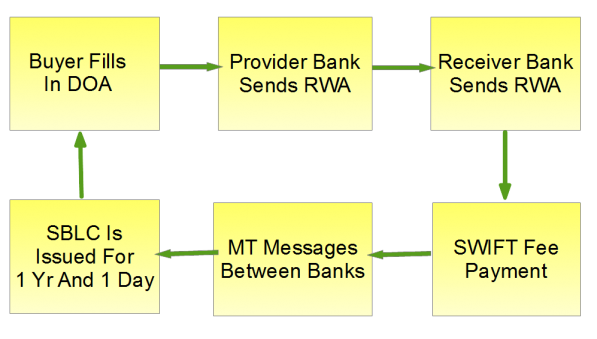 After the DOA and RWA are signed and SWIFT fees are paid, the banks of both parties will message each other until the instrument is transmitted to the Receiver. In some agreements should one fail to meet the timeline, there will be a penalty and risk of no further business. Two things to take note: 1) There is no standard leasing process, leasing programs differ and each determined by the Provider. 2) The Provider instructs the bank what to do therefore if you choose to go through a bank for an sblc service, you may be faced with lots of paperwork as they have policies and guidelines to adhere to. 1. A performance standby – backs a commitment to perform other than to pay money/funds and includes an obligation to pay for loses occurring from a default of the buyer in the process of completing an underlying transaction. 2. An advance-payment standby – supports an obligation to account for an advance payment made by the supplier to the buyer. 3. A bid-bond or tender-bond standby – backs an obligation of the buyer to execute a contract if the buyer is awarded a bid. 4. A counter standby – backs the issuance of another, separate standby letter of credit or other undertaking by the supplier of the counter standby. 5. A financial standby – supports an obligation to pay funds, including any instrument evidencing an obligation to repay borrowed money. 6. An insurance standby – supports an insurance obligation of the applicant. 7. A commercial standby – backs the commitment of a buyer to pay for goods or services in the event of non-payment by other methods. 8. A direct-pay standby – intended to be the primary method of payment. It may or may not be linked to a default in performance or payment. Also referred to as a lease funds arrangement a lease proof of funds can close in a matter of days as opposed to weeks and months on transactions of great magnitude. The process is shorter compared to what banks typically require clients with little transactional history with an SBLC. The POF SBLC provider requires the client go through normal banking to set up a bank account with full disclosure of personal and corporate identity, a background check is completed to ensure there is no criminal history. Upon engagement with a new POF SBLC transaction the asset holder and their attorneys, bankers, and compliance officers seeks to ensure the use of funds is not be for illicit purposes and abides generally accepted business practices. The proof of funds provider wants to make sure the client has the fee money currently available to use for the lease SBLC. Please provide your most recent bank statement or escrow statement with contact information. Providers will shy away from clients that have no personal capital of their own who hope a bank undertaking by bank promissory note, commonly called an Irrevocable Conditional Pay Order (ICPO), will pay for the lease fees after the instrument is delivered and financed. (ICPO) is not acceptable under no circumstance, this is a cash first transaction. As another requirement, the POF SBLC provider wants to ensure that their asset is going to return at the end of the borrower agreement without any liens, attachments, restrictions, or encumbrances. To do this they often require the borrower provide from the beneficiary a bank undertaking aval to return the SBLC prior to the expiration of the lease, or otherwise the borrower may extend the contract. Americap Direct provides POF SBLC issuances with first a pre-advice SWIFT MT799 and then a SWIFT MT760 full bank to bank delivery. However, not all SBLC transactions need to be issued by SWIFT. The borrower may also elect to use other generally accepted bank to bank documentary evidence of issuing the bank instrument. When dealing with a leased standby letter of credit it is not customary for the issuer to deliver the bank instrument through DTC, Euroclear, Clearstream or other clearing houses. Such delivery is reserved for equity purchases, such as in buy/sell transactions. The asset holder stands too much risk and lessens the possibility of getting the instrument returned on time according to the loan agreement. When you approach banks for loans and advances for business purposes they insist on collaterals. From US$2 Million (Rs.10 crores) and upwards Standby Letters of Credit can be used as collateral. Your bank may provide upto 80% of the value of Bank Guarantee / SBLC as loan. The term is usually One year extendable yearly upto 5 years. Leasing fees and commission total from 12% to 20% per annum depending on the issuing bank, value of the BG-SBLC etc. If you have a good relationship with a bank and you can utilize this opportunity contact us to know more. After leasing an SBLC, you may want to monetise it. 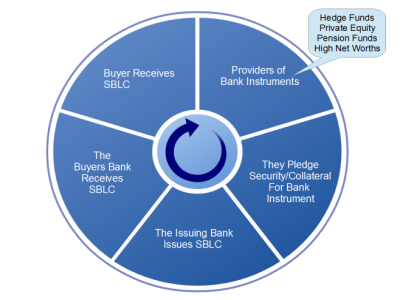 All that happens when you monetize an SBLC is the instrument is converted into legal tender. This can take up to 15 days to process and verify. Your bank should be able to do this for you. It wont be monetised for the full amount as it can vary on a number of factors such as; bank rating, country of issuance, LTV … etc.. The instruments must be in your name and there is a time limit on a leased SBLC’s. These bank instruments can only be leased for one year and one day. Bank instruments are checked for forgery and there are strict guidelines to adhere to. Heavy due diligence will be undertaken. Banks that issue fresh cut bank instruments must be UCP-600 compliant and be a top banking institution. Purchasing an SBLC, it is similar to the process of leasing a StandBy Letter Of Credit. The main difference is that you own the instrument in your company /name. For example: The Provider is the asset owner, asset holder and asset controller. If you choose to purchase the SBLC, the title of goods will be transferred to you. Purchasing an SBLC is advantageous in that you can then choose to lease the instrument out if you so choose to do so. Ask us about our low cost SBLC’s that can be put into a managed trade platform. Other projects in the pipeline thus having to wait a few months. Financing projects with an SBLC can be a cheaper and faster route as the procedure takes a few weeks and is less onerous. Leasing a bank instrument can be also a cheaper as some investment banks charge thousand of dollars to fund a project. Please note; it is our requirement that we ask you to provide Proof of Funds and/or a bank comfort letter. 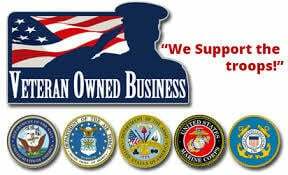 This is to demonstrate to the Provider that the companies we represent are in good faith and in trust to pay lease fees. When people apply for an Standby Letter of Credit most do not understand how the mechanism behind the transaction works. 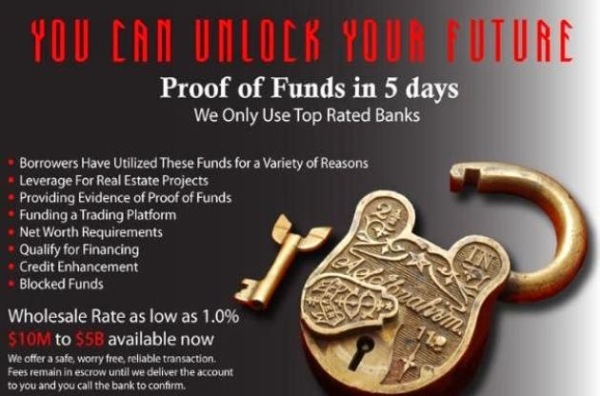 There are certain buyers who think that there are no fees involved when issuing a bank instrument and presume the SWIFT messaging service is free. This is not the case. The banks of both parties communicate as per the DOA agreement using SWIFT messages, recognizable to us as MT messages. Please check on the search engines for SWIFT Fees (Link to another website with typical SWIFT charges). Sending a SWIFT message isn’t cheap, these are banks charges! We suggest that if you need an SBLC, prepare at least 12% of the asking amount to go towards the cost of an SBLC. One way in which the buyer might not have to pay SWIFT Fees is by having the bank issue a Bank Comfort Letter (BCL). This letter just sates that the Buyer has the funds. This needs to be arranged before the DOA is signed. Depending on the Provider we generate our fee from the cost of the instrument. You may notice a purchase/lease price plus a commission price eg (10+2). The commissions are paid for any intermediaries/brokers. 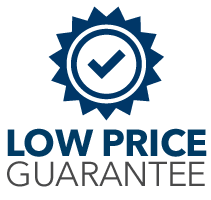 We keep our commissions low to Provide you with a fair deal. Need A Large Bank Instrument? If you need a Stand By Letter Of Credit for a substantial amount (ie in the Billions in tranches), we can arrange this for you on a case by case basis. Please note that it is NOT advisable to change the SBLC Procedure written in the DOA. We are not in a position to dictate to our Providers how to operate their Procedures. We are able to give you a few choices on different Providers. Changing procedure terms can be frowned upon as it makes the validity of the SBLC enquiry questionable. We have partnered with a firm to provide trade and commerce letters of credit for straight forward transactions. please let us know your requirements on the contact form. 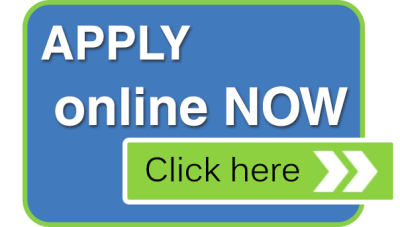 You can apply to have an Standby Letter Of Credit either through a bank or use our services. We can give you a number of low cost options to help fund your project. As our team has streamlined the process the paper work saving time and headaches! We can walk you through the process from start to finish. Technically speaking, “Banks DON’T issue Standby Letters of Credit” Instead, the bank is the deliverer not the initiator of the transaction, they CONFIRM their client has the sufficient funds. For example; let’s pretend you use a courier to deliver a parcel to a customer. You are the Provider of the parcel and the courier is the delivery agent who delivers your parcel to the Receiver. The courier isn’t the Provider of the parcel, they are just the delivery agent whom the Provider uses to send the parcel from the Providers location to the Receivers location. As discussed at the beginning, genuine SBLC Providers can be hard to come by. The banks don’t advertise SBLC’s as their own bank products, simply because they are not allowed to. Standby Letters of Credit are provided by high net worth clients with large cash holdings in an account at the Bank. High net worth clients are usually hedge funds, private equity, pension funds, and large coprations etc.. It is very difficult not only to get in touch with bank instrument Providers, they are very strict too, they don’t mess around. Genuine Providers perform many checks and balances which means that any authorised mandate agents connected to Providers are too follow strict procedures. This is good new on our part as we know we carry clean business but it means that any business we introduce needs to be able to follow certain procedures. Because of the strict ruling, Americap Direct will let you know what is required but in general we will ask for POF and BCL to say you can pay for 10% of the LTV/face value of the bank instrument. We want to know that every business that passes us has the capability to afford the lease fee.